Complimentary 4 Piece Bestseller Kit with a Ubtan Soundarya (8gms), Toner (10ml) & 2 Facial Creams (2gms) on Forest Essentials orders worth Rs. 2499 & above. Offer valid till stocks lasts. The Kashmiri Saffron and Neem infused Delicate Facial Cleanser by Forest Essentials, gently cleanses your face to remove surface toxins, impurities and leave glowing skin after each use. Saffron has always been used in traditional formulations for glowing skin, along with Neem for purifying and deep cleansing. 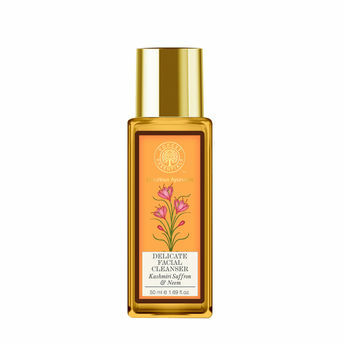 These enriching properties makes this cleanser an ideal choice for getting touchably soft and nourished skin. Explore the entire range of Cleanser available on Nykaa. Shop more Forest Essentials products here.You can browse through the complete world of Forest Essentials Cleanser .Alternatively, you can also find many more products from the Forest Essentials Delicate Facial Cleanser - Kashmiri Saffron & Neem range.